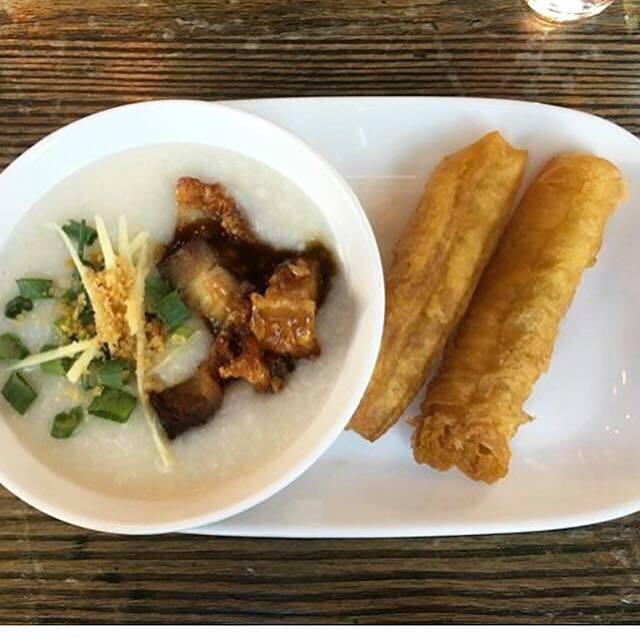 Pork belly congee on the brunch menu at Soi. Did you spend your Saturday morning running through Magnuson Park? Or were you binge-watching Netflix in your fat pants? (Hey, no judgment here.) Either way, we’ve got six new weekend brunch options. The “global Pacific Northwest cuisine” of this beautiful, modern replacement to Sazerac is decidedly more all-American in the a.m.: house-made granola, malted waffle, benedict with Benton’s ham, etc. When chef Eric Rivera took over the kitchen, the menu at this book-lined restaurant got a serious revamp in the best possible way. Chef’s Afternoon Delight in the Author’s Corner is a weekend brunch tasting menu ($45) that ranges from salads to creative tea sandwiches to sweets. The all-white décor of this darling Renee Erickson spot lives and breathes brunch—the order of champagne and oysters is a logical, though pricey, choice. Find other unconventional options like nettle-filled crepes and steak tartare, and top it off with a General Porpoise doughnut. Brunch hours: Saturday and Sunday, 10 a.m. to 2 p.m.
Just a few doors down from Bar Melusine (brunch crawl, anyone?) is this Thai eatery with one of the most interesting brunch menus in town: street-food-style roti with condensed milk, fried mussel omelet (hoi tod), massaman French toast, pork belly congee, and mango mimosas by the carafe. Brunch hours: Saturday and Sunday, 11 a.m. to 3 p.m.
That’s pronounced “mar-meet,” not “mar-might” like the salty, funky yeast extract of the same name that you may have tried on a dare. Here, chef Bruce Naftaly is cooking up buckwheat pancakes, sherried mushrooms on toast, the excellent fried Jerusalem artichokes you can also get during lunch and baked goods from Amandine next door. Brunch hours: Saturday and Sunday, 10 a.m. to 3 p.m.
Burgers for breakfast? Not exactly. Head over to this casual counter-service spot in the Central District for biscuits and gravy, loco moco, and bodega-style breakfast sandwiches on weekend mornings. Brunch hours: Saturdy and Sunday, 10 a.m. to 2 p.m.